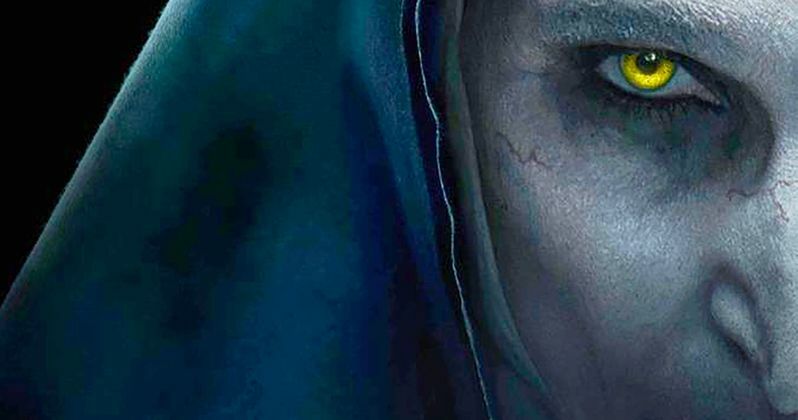 The first poster and official image for The Nun have dropped online. The trailer is set to arrive online tomorrow, but the studio wanted to give us a little something to help tide us over while we wait. As such, we've got the first poster for the spin-off, which promises that this is going to be the darkest movie in The Conjuring universe to date. That's a rather bold claim and one that horror fans can hope will be backed up by the first footage. The Nun poster isn't a complicated, overly photoshopped nightmare. It's rather dark and simple. The demon nun Valak looms large in the darkness, with only half of her face showing. Then there's the tagline and the title. That's about it. But simple does tend to be effective when it comes to things such as this. Anyone who saw The Conjuring 2 likely already has a very healthy fear of this horrifying nun and needs little else to get creeped out. An official image from the movie has also debuted online. The image showcases Taissa Farmiga's character Sister Irene, who is one of the main characters we'll be following in the movie. She's actually the real-life sister of Vera Farmiga, who plays Lorraine Warren in The Conjuring movies. The image shows the younger Farmiga in a very religious but very unsettling setting doing some investigating. We can only guess that investigation is going to lead to some ugly and scary places. Director Corin Hardy (The Hallow) had this to say about The Nun. "The period and the setting and the scope of it hark back to really classic, old-school, scarlet-blooded horror films. And I loved that the story was a character-driven mystery as well as a scary horror movie." This particular entry in the franchise takes place in the 1950s and sees Sister Irene assisting Father Burke (Demian Bichir) in investigating a mysterious suicide at a covenant. This eventually leads them to Valak and things will get horrific and allegedly very dark from there. Bonnie Aarons, who brought Valak to life in The Conjuring 2, returns to reprise the role in The Nun. James Wan, who directed both of The Conjuring movies, is involved in the spin-off as a producer. The four previous movies in The Conjuring universe have brought in a combined $1.2 billion at the box office, making it one of the only cinematic universes in Hollywood that is truly working well. Warner Bros. and New Line are set to release The Nun in theaters on September 7. Be sure to check back with us tomorrow as we'll have the trailer for you to check out as soon as it's made available. For now, you can check out the movie's first poster, as well as the new image, courtesy of Empire, for yourself below.